You do not need to adjust your screens. 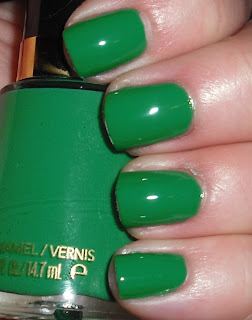 I did buy this green polish! I am very impressed with the new Revlon shades. It was MUCH needed. Revlon's previous core line was some of the saddest bunch of granny colors I've ever seen. I'm glad they've revamped their image and now are offering some trendy and funky shades. I saw this green, and I couldn't pass it up. Posh is a true green creme. I say it's a true green because I do not feel this leans either warm or cool. It's just green. I'm sure there are better ways to do describe this, but that's not my forte! The formula on this was nice. Like, I said I'm so impressed with the Revlons lately. I think their formula has improved as well. Great polish all around! What do you think of the new Revlon polishes? I saw this polish but passed it by, now I really wish I didn't. Green's like this are hard to find! I don't know how you can paint your nails this so perfect way. It's absolutly fantastic. Greens look good on you! Thank you :). You should email me and give me a link to your blog. You should! I think you'll be impressed with the colors they offer now. Aw, it's not perfect, but it's definitely an improvement from the beginning of my blog. I guess the trick is practice, good lightning, and patience. Revlon core line full of granny polishes?!? Never! *sarcasm*. That made me litterally laugh out loud. This is such a great green!! I've always loved Revlon, guess that makes me a granny, lol. But I love it even more now. They have a lot more vibrant and trendy colors. I saw the fresh display that must have gone in that day in a Walgreens shortly after Xmas. I had no time before having to get to a med appt to look other than I saw a new cylinder shaped bottle. Since then, have heard from others who have seen display in their areas, going very fast - well picked over. I never though the core line would appear in a new shaped bottle in my lifetime. The classic 'now old bottle' I recall from the 60's. Not sure if it was around in the 50's as well...in fact not even sure Revlon was out in the late 50's.Maybelline & MaxFactor were the big ones I recall from back then that were available easily for general public. This green looks a lot like China Glaze Starbord.